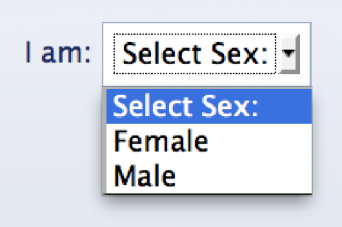 Facebook’s introduction of PGPs (preferred gender pronouns) and new gender identity options allows users to choose among Female, Male or “Custom” where they can then view a multitude of trans* and non-binary gender options. On Thursday, February 13, the queer world was abuzz with news that Facebook was opening up their gender specification fields and allowing a vast array of identities to be easily expressed via profiles on the online social networking site. The changes have been hailed as an important step forward in recognizing LGBTQ identities and gender variant people. From “Cisgender Woman” and “Transgender Man” to “Genderqueer”, users in the US can now express their gender identities a little more accurately on the site. Users can also select their preferred pronouns: “she”, “he” or the gender-neutral “they”. Posted February 14th, 2014 & filed under News.